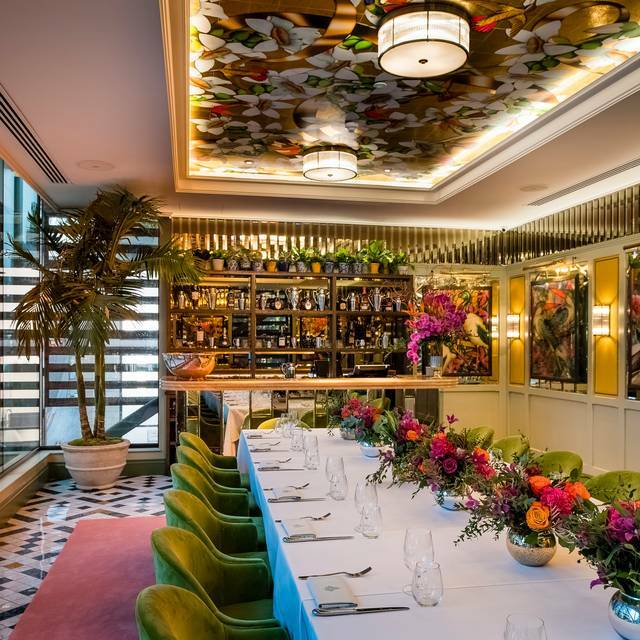 The Dalton Room at The Ivy Spinningfields seats 18 guests on one long table or 20 across two rounds of 10. 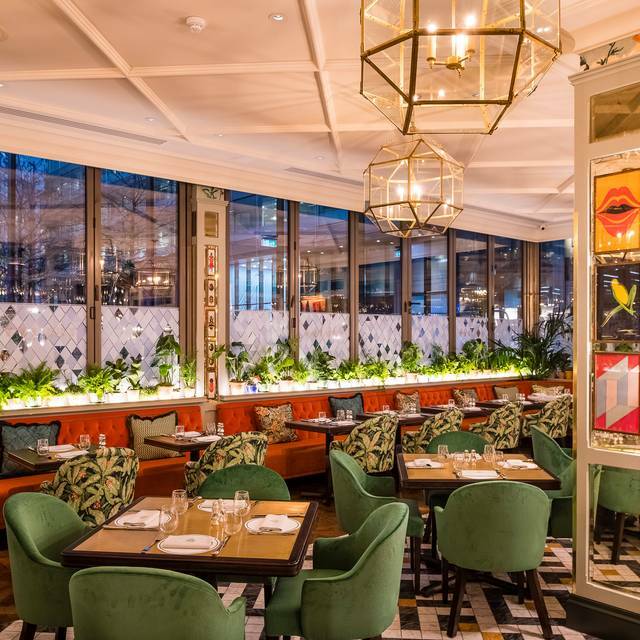 This exclusive space in the heart of Spinningfields is available for breakfast, lunch and dinner, as well as drinks and canapé receptions for up to 40 guests. 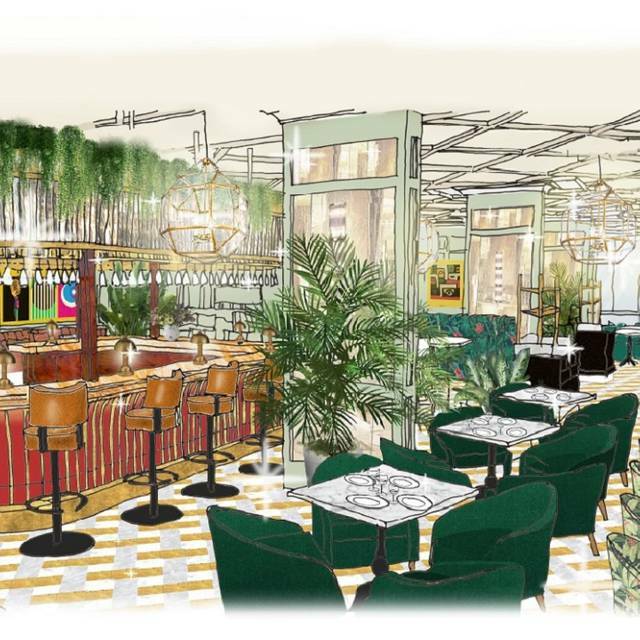 The bespoke patterned white Carrara and grey Fior de Pesco grey marble tiled flooring, eclectic mix of vintage dining chairs upholstered with bold floral and palm printed fabric, and hanging gilt leaf pendants add a touch of glamour to the room. 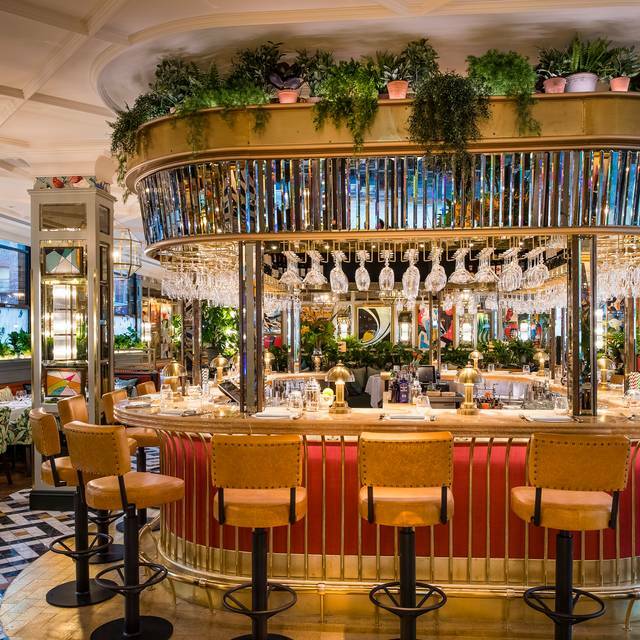 Taking centre stage is a striking ceiling coffer, complete with cotton flowers in a nod to Manchester’s former “Cottonopolis” heritage, set against gold leafing. With a selection of Ivy brasserie menus available, specially created by our Executive Chef, Sean Burbidge, The Dalton Room is equally suited to private parties and celebratory dinners as it is for corporate breakfasts and lunches. Located in the heart of Manchester, Spinningfields, the restaurant occupies an impressive space within the new development, The Pavilion, surrounded by greenery yet situated in the centre of the city. 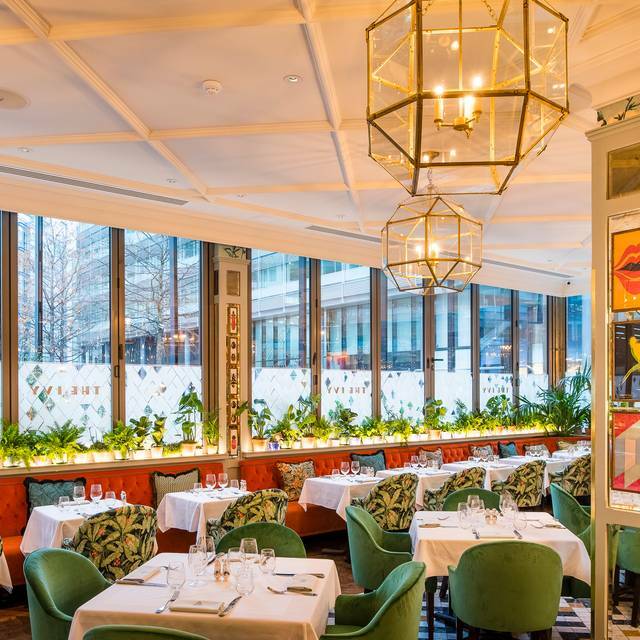 The Ivy Brasserie is open all day, seven days a week. Serving modern British classics for breakfast, lunch, dinner, weekend brunch and everything in-between. The Ivy Asia and Bar is located on the second floor, open seven days a week from 5pm and from 12pm at the weekends. 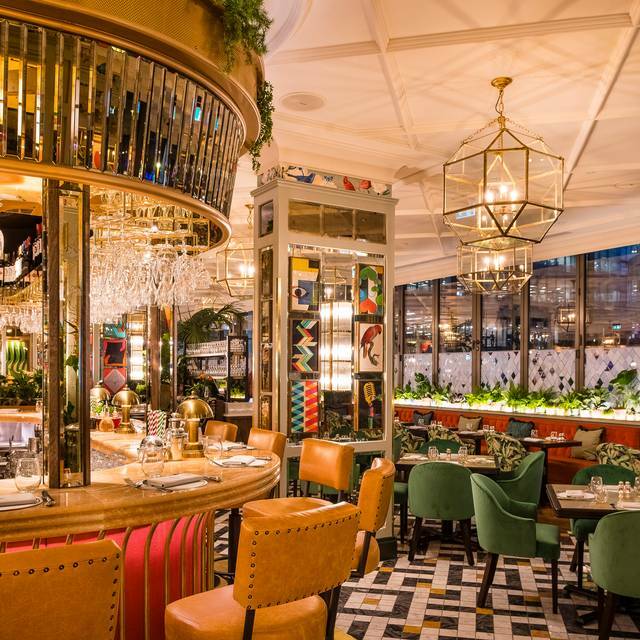 There is a central glamorous late night bar and the restaurant is illuminated with a show-stopping green, semi-precious stone floor serving Asian-inspired cocktails and sharing dishes with entertainment and resident DJ’s. We have been to the Ivy a couple of times before and always been very pleased with everything. However I'm afraid that the food was not up to their usual standard this time. We both had the chicken Milanese and the chicken was dry and the breadcrumb coating burnt. Service was perfect the food was great. And sadly this time wasn’t the best - hence I won’t be rushing back! It started with the drinks 2 drinks requested were out of stock so the designated driver had water , the burger came over cooked and tasted burnt so we asked for it to be changed . The floor manger cake over and said due to the confusion our desserts would be on the house however only 1 was on the house and we was still billed for the steak sandwich. The place itself is still amazing and our waitress was outstanding she couldn’t do enough for us ! We were attended to by Thanos who was fantastic. Food was lovely and they catered for my friend with food intolerances. A lovely birthday treat and we will definitely return. Absolutely beautiful venue in Spinningfields, six of us had breakfast after a night out in the city centre, of course its pretty pricey but the quality of the food and the fabulous service made it worthwhile. Great place to eat, lovely staff and great service. Little pricey. We would like to say a huge thank you to both Adam and Toby who were excellent waiters and took great care of us. We were well looked after and it made our anniversary extra special. Thank you so much for an excellent service. 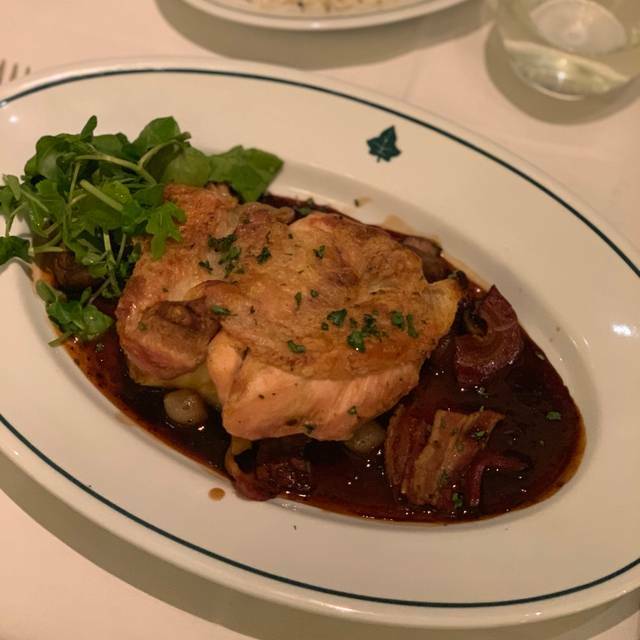 The Brasserie is stunning, as is the bar on the second floor, and we really enjoyed the food. Would definitely come back - especially to check out the rooftop bar as we didn't make it up there! Greeted at the door by uniformed staff and directed to reception where our booking was checked and coats taken. Led to table by a waitress, all very efficient. Menu was good with plenty of choice and a range of prices. All the food we had was delicious and portions were just right. Service was attentive but not obtrusive. Very impressive. Would have left a decent tip anyway because of levels of service; not impressed by "discretionary" service charge of 12.5%, which we paid as service was so good. Would prefer service charge to be genuinely discretionary. But all in all a good experience and would go again and recommend. really lovely staff from the moment you enter, I left my glasses in a bag that they had put in their 'luggage' room-they said it was no trouble at all for them to get it for me, each course lovely no faults whatsoever. If I had to make one tiny complaint it would be that they asked if we wanted still water with our meal-we had also ordered prosecco- we said yes and they brought a bottle and charged us £3 +for it, but when we asked for some water later on with our sweet course they asked if we wanted tap water, just think it is a way of getting a few extra pounds out of you. Service was great but the food quality was not what it was supposed to be. Chips were terrible and steak was well over cooked. Excellent food, service ambience a vibrant atmosphere which is really needed to escape the doom and gloom of Brexit. There really is nothing more I can say apart from the fact that I have made another booking. Great food, I have had very few meals where all three courses were impressive. However, portion size is set where 3 courses are needed. Have a big breakfast! This makes the bill pretty high, but would still recommend. Our waiter was friendly enough but we asked for the house red which on the menu it was Sicilian but when he brought it and opened it we didn’t notice until we looked at the bottle that it was French - he said it was the same price and was better but he just didn’t make us aware. Also one of our sides came late. We regularly go to the Ivy in London and this just didn’t feel the same. From start to finish excellent service. Everyone made you welcome. Food outstanding. lovely food , lovely waitress, and amazing place. 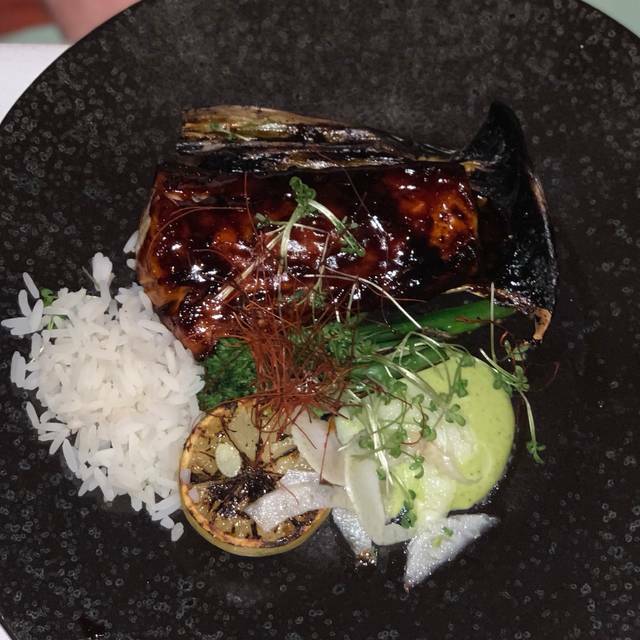 It was our first visit to The Ivy and would describe it more of an experience than just going for a meal. From the warm relaxed efficient welcome to the attentive table service from Lucas, the staff were faultless. The menu offered a good choice but with 2 of the 4 dinning that wouldn’t pick fish options, slightly limited the Brasserie menu choices. What we did order was delicious and the flambé apple tart made a good photo ! We will be returning ! We had the best time - great food and drinks, excellent service and amazing company. What a place - the decor and ambiance are outstanding! Will definitely be back! A very good breakfast and fabulous surroundings. It feels special without being stuffy. Atmosphere was brilliant and being a Saturday night it was the perfect place to be staff was amazing 10/10 except our waitress sadly ordered our drinks my friend ordered a large coke it come in a large glass and was half full we jokingly said that looks a bit empty she ordered a large the waitress rudely tried to tell us we don’t do draft we pour from the bottle which was fine we just expected her to fill a normal size glass and pour two in lol definitely give a new meaning to is the glass half empty or half full lol it was definitely flat ! And I had to the worst mocktail I’ve ever had the drinks was awful but food was delicious 10/10 generous portions very decretive inside its trendy it’s the new in thing a must try for any local Manchester diner who wants a little something different other than that will go back but next time make sure our drinks are worth drinking and perhaps get a full glass of Coke cola ? 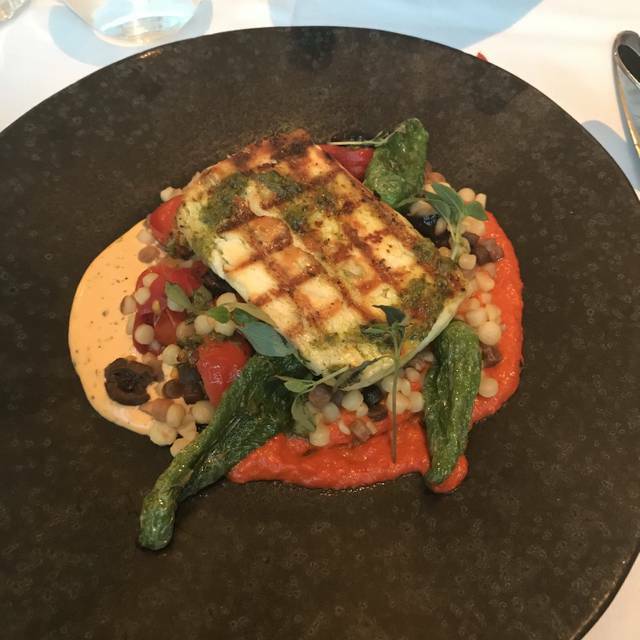 I would definitely recommend dining here - The Ivy is absolutely beautiful, décor is stunning - service was excellent and the food second to none - so much so that we booked for May and June 19. The beautiful room on the second floor served lovely cocktails and again the atmosphere was buzzing - fabulous as it was my daughters birthday. The ladies wc are exceptional - the décor is stunning. The staff were so friendly and helpful. Do not hesitate to try. Definitly be back soon !!!! Consistently good food, great atmosphere and service. Excellent value for money. Went for brunch with my husband and baby daughter. Staff were very friendly and helpful. We were seated in a nice, quiet corner. The food menu was enticing (although a few more seafood options would've been good), as were the tea and cold drink selections. The atmosphere was relaxed and, overall, we spent a very pleasant couple of hours there.